OTTAWA — The Ottawa Senators have been outshot in all but one game this season, so a first period in which they outshot the Detroit Red Wings 16-2 Tuesday was an interesting turn of events. Patrick Wiercioch‘s first goal of the season at 14:37 of the third period broke a tie and sparked the Senators to a 3-1 win at Canadian Tire Centre, but it was the start that set the tone. Detroit coach Mike Babcock was displeased with the effort from his players. “We saw urgency from [the Senators],” he said. “I thought they played good and I thought we were as bad as we could be. I haven’t seen us like that this year. You don’t like to see many games like that. It’s disappointing obviously. “Our preparation, the job we did as coaches and the focus we had for the game of taking care of the puck, we obviously didn’t get our message across and didn’t do a very good job of having our team ready. Senators captain Erik Karlsson, with his fourth of the season, and forward Clarke MacArthur, with a goal into an empty net, also scored for the Senators, who opened a four-game homestand. Karlsson, coming off a minus-4 performance Saturday in a loss against the Boston Bruins, pinched at the Detroit blue line to keep the play alive. The Red Wings, despite being soundly outplayed in the first, tied the game 1-1 at 2:34 of the third period on Henrik Zetterberg‘s fourth goal of the season. The Senators were scrambling around their net after a shot by Detroit defenseman Danny DeKeyser was stopped by Anderson. The rebound went to an open Zetterberg in the slot and he put a backhand by Anderson high on the stick side. The Red Wings had a great chance to take the lead in the sixth minute of the third period after a giveaway by Karlsson resulted in a 2-on-1, but Anderson made a sprawling save on Detroit right wing Tomas Jurco. “It was 1985 there,” Anderson said. “My first save as a kid was a two-pad stack. It was one of those things where you don’t think, you just react. I was just fortunate he didn’t get it any higher, because he had the top of the net. The Senators improved their record at home to 3-0-2 and Karlsson said the tight defense they played in the first period was good to see after a 4-2 loss to the Bruins. The Red Wings said they couldn’t overcome the slow start. The line of Kyle Turris between MacArthur and Bobby Ryan helped the Senators get off to the good start in the first period with a couple of good chances and there were also some good shifts from the rookie line of Curtis Lazar, Mike Hoffman and Matt Stone. Turris had the Senators’ best chance to score prior to Karlsson’s goal when he had a shorthanded breakaway with Karlsson in the box three minutes into the second period. Turris got a breakaway when Zetterberg’s stick broke and the latter went to the bench, but Howard stopped Turris’ wrist shot with a glove save. A minute into the second period, Turris fired the puck into the open net after Red Wings defenseman Brendan Smith collided with Howard, knocking him down and into the Detroit net. It was ruled no goal by referee Brad Watson because Howard was injured on the play. After having two shots in the first period, the Red Wings created some chances in the second. Anderson stopped Red Wings forward Justin Abdelkader with back-to-back saves after Turris’ breakaway. Anderson made his best save of the second period after he gave the puck away behind the Ottawa net. The Senators goaltender scrambled back into position stop a shot by Detroit’s Riley Sheahan in the 15th minute. 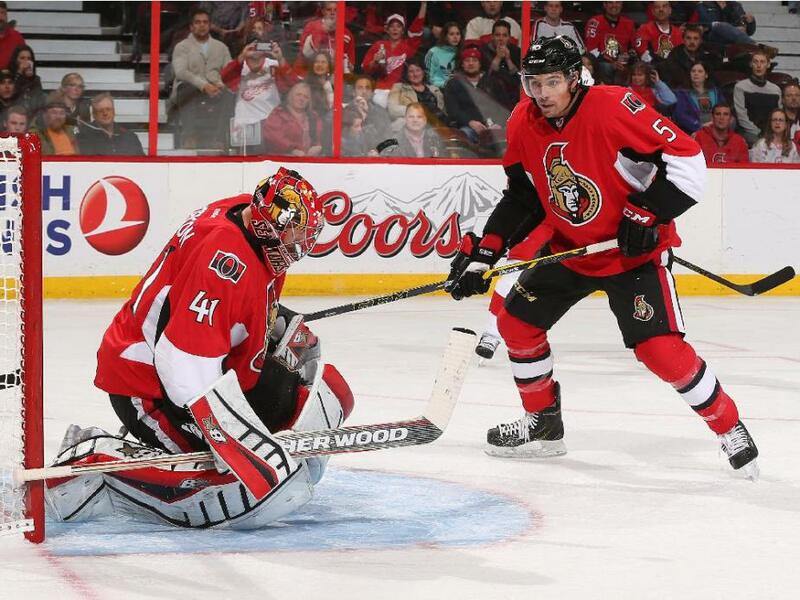 Ottawa defenseman Chris Phillips left the game in the third period because of a lower-body injury and did not return. Senators right wing Alex Chiasson was scratched and was replaced in the lineup by Erik Condra. Chiasson was injured Saturday when he blocked a shot against the Bruins. Chiasson is day-to-day.